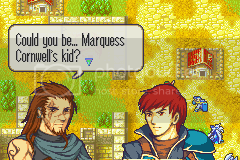 So I just started Eliwood's tale after beating Lyn's Tale(as well as the gaiden for that tale. Speaking of that...ARCHIBAAAAAAAAAAAAALD. You know why.) I'm digging the new map. I'm holding out for a complete version of this before playing. You know what you're going to have in the final version, or is there currently no end to your EN plans yet? No, it should be Vergil! In the final version, I'll have 8 main tales (Eliwood, Lyn, Hector, Pent, Raven, Karel, Zealot, Legault), 3 maybe 4 gaiden tales, and one last tale to cap things off in an epic fashion (and provide a nice segway to FE6). 20 achievements to get, and 17 pieces of unlockable bonus content. Currently Raven's Tale is in progress, and the next three tales will be ports of existing code (so, in other words, they should go fast if I'm properly motivated). Then all that's left is the final tale and tying up loose ends. The end is in sight. Got bored in the car today, so I coded this feature that I didn't really need. I was considering doing reinforcements from those stairways, but decided that this would be a much cooler way to let myself know that I can still code neat stuff. First of all if they get danced they can wait on the tile, move, and then move again... a similar problem happens with being, say, rescued. Also, I didn't know what to do if say, an enemy unit tried to move on the staircase (EDIT: to clarify, I mean like, the staircase on the opposite side of the map--if they blocked that square, would your guy not spawn just like how you can stop enemy reinforcements from spawning? XDDD). In the final version, I'll have 8 main tales (Eliwood, Lyn, Hector, Pent, Raven, Karel, Zealot, Legault), 3 maybe 4 gaiden tales, and one last tale to cap things off in an epic fashion (and provide a nice segway to FE6). 20 achievements to get, and 17 pieces of unlockable bonus content.That specific enough? :P:Currently Raven's Tale is in progress, and the next three tales will be ports of existing code (so, in other words, they should go fast if I'm properly motivated). Then all that's left is the final tale and tying up loose ends. The end is in sight. Aaaahhh!! No, Y U NO USE SPOILER CAPS!!? Wow, I know you're a great coder and all, but coding while driving? Damn dude, props for that, get bored more often! Disclaimer: The creator of Event Assembler is not responsible for car accidents that happen during or after event hacking. Hey, I'm just wondering, but how do you get the gaiden chapters? I've been trying to get them, but to no avail. Perhaps he thought this up while a passenger? I see one of my favorite characters. . .is last. I'll wait until I have time before attempting this. Well I love the hack but I think I found a bug. I started a new game and tried to skip the Elibe intro, which worked, but the background of the next scene changed to lyn's prologue map. The cutscence kept going (don't know if this is supossed to happen but I couldn't skip the rest of the cutscene) and when it was over I got to the tale select screen. I wonder if we can disable skipping the Elibe intro screen. Or SPACEBAER I like the intro and appreciate the work that went into it, don't hurt me. You can get hacks on an actual GBA? 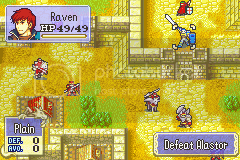 In other news, Raven has become Ike. Similar facial structure, same pauldron, and a one-on-one showdown with his mortal enemy. In Tale 5 pt. 2, he transforms into a cyborg and replaces his right arm with a sword. Also, the first part of Tale 5 will be on full display during FEE3. Hope you're all looking forward to the show! 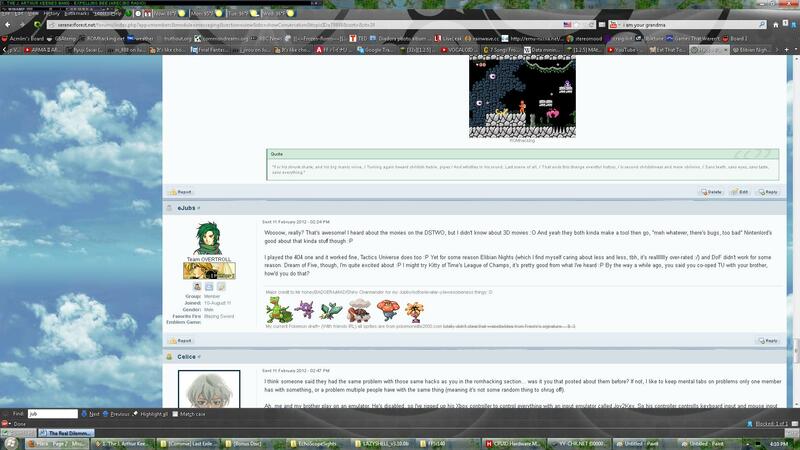 Yeah, however, a couple of the hacks from this forum do not work on the actual hardware. I believe this is one of them, though it hopefully's been fixed. The only issue I've ever had reported is that custom spell animations experience severe slowdown on the native hardware. This, unfortunately, would require an entire rewrite of the CSA system designed by Xeld. Fixing that is way above my pay-grade. Apologies for any convenience to people who enjoy flashcarts and such. Turning the animations off is, unfortunately, the only work-around at the moment. If yours is one of the hacks Jubby mentioned, it didn't even boot properly. You can clarify with him if it was, as I can't remember where he said it. A handful of popular ones from this forum and FE Universe were incompatible. EDIT: Ah, here we go. I blame whatever flashcart they are using; I've had little to no problems with any Fire Emblem hacks on my superior SCDS2. The only problem I usually see in emulation is an issue with the palette on the no-animation HP bars--i.e. when you turn animations off and it just shows the map battle with the red and blue box next to each other, the colors screw up, but it's a very small problem that hardly affects one's experience. EDIT: should you really be sharing private conversations, Celice...? I blame whatever flashcart they are using; I've had little to no problems with any Fire Emblem hacks on my superior SCDS2.